As a Richmond property owner, you have an obligation to keep your home or business looking its absolute best. One of the hardest aspects of this responsibility is keeping the exterior of your property clean. The elements, dirt, algae, and other outdoor contaminants are always collecting on the surface of your property. The best and easiest way to routinely clean th exterior your home or business is to hire a professional power washing contractor for help. At RVA City Painters, our Richmond powerwashing contractors are ready to assist you. Through our commercial and residential exterior cleaning services, we can restore various portions of your property to their original beauty. You and your family will once again be able to take pride in the look and feel of your home. Your business will present a professional and inviting image to potential clients and customers. You and your family want to be able to take pride in the look of your home. Not only do you want friends and guests to form good first impressions about your residence, but you also want the neighborhood to be accepting of the appearance of your house. Even more importantly, you and your family want your home to be as beautiful as possible. Our Richmond powerwashing contractors can help you achieve all of these goals. As to assisting in first impressions, we can blast away years of rust and oil stains from your driveway. By cleaning the largest pathway to your property, we can make certain that people who are invited to your home will be excited to be there. As to the neighborhood, our pressure washing experts can clean your siding. This will enhance the curb appeal of your residence, which in turn will add value to your home. 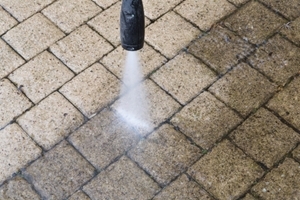 As to your unique enjoyment, our team of pressure cleaning specialists can clean and restore decking and fencing for you. This critical fixtures are only as enjoyable as they are beautiful and easy to use. It goes without saying that if your commercial property is unsightly, clients and customers will seek out the services and products of competitors. By hiring our contractors to conduct routine cleanings via powerwashing in Richmond, you will never have to worry about the appearance of your commercial property negatively affecting your bottom line. Our team can clean any hard surface of your property. In the end, your business will look its absolute best. You, your employees, and your customers will be better off for it. Power washing is also a great first step toward ensuring excellent results for exterior painting projects. If you are planning to paint the exterior of your home or business, give our Richmond painting contractors a call. Not only can we clean and properly prepare the surface to be painted, we can ensure the entire job is completed without a hitch. Let us help you take care of your exterior renovation needs today with a bit of power washing and paint! If you are interested in enhancing your home or business with powerwashing in Richmond, VA, then please call 804-557-4898 or complete our online request form.